It used to be that a flashlight was a flashlight, and your only choices were either a flashlight, a bigger flashlight, or a really really big flashlight. These days, however, things are quite different. All it takes is a quick Google search to find a dizzying array of flashlight offerings, entire forums dedicated to flashlights, flashlight collectors, and flashlights made with every type of light bulb imaginable in every configuration possible. To help make some sense of today’s flashlight market for the average guy who just wants a good solid flashlight with maybe a bit more performance than plastic department store offerings, we’ll go over the most common types of flashlights available and provide a little bit of information on why each is different, why they're popular, and what makes them a good choice depending upon your needs. Hopefully by the end of this article you’ll be able to talk flashlight with the best of em, and even better, find the right flashlight for your needs. This one is the flashlight that has sat in your toolbox for the last year. You know, the one with the dead batteries and broken switch. The one you usually go out and replace rather than try to resurrect with a fresh set of D-cells. THAT flashlight. Anyhow, these flashlights have been a staple of the American household for decades and have been popular primarily because they’re cheap. Made of plastic, containing a single incandescent bulb, and powered by two common heavy duty D-cells, these flashlights have as their main and only selling point their low price. They usually produce a weak beam, have a cheap plastic lens, a simple sliding switch that breaks often, and can be expected to rarely survive more than a year of use before requiring replacing. Battery life on these flashlights is dismal, and lumen output is not even worth mentioning. These flashlights can usually only be counted on to fail when really needed. These flashlights represent a step up from the common utility flashlight. Usually marketed as “Heavy Duty” or “Industrial”, these flashlights are constructed of heavier plastic or plastic composites that stand up to abuse a bit better than cheap utility flashlights, but are still susceptible to being easily damaged by dropping or rough handling. These heavy duty flashlights often contain a better grade of incandescent bulb, usually a Krypton lamp, and offer better light output. Powered by 2 alkaline D-cell batteries, these units have an average battery life and make a good standby light for under the kitchen counter. They can be identified by their slightly heavier housing, switches that are often a rubber encased push button or interlocking slider design, and an all around heftier feel. Light output for these heavy duty units is usually around 17 lumens for Krypton bulb models. Work flashlights offer substantial improvements in performance and durability over common utility and heavy duty flashlights. Designed for everyday use, these flashlights make use of plastic/nylon composites to create a durable housing that can withstand a moderate degree of abuse. These work flashlights can often be found with a rubber encasement over their composite housing, adding an increased degree of comfort and durability. Work Flashlights are often water resistant, but not entirely waterproof. Switches for these lights are usually a rubber encased push button design, and bulbs are usually Krypton or Xenon units that offer good light output. Typical light output numbers for these work flashlights are 17 lumens for Krypton bulb units and 20-30 lumens for Xenon bulb units. Battery life is average, but often declines rapidly after only an hour of use due to the higher output of Xenon bulbs. Tactical Flashlights: Tactical flashlights represent a truly effective form of portable lighting, and good quality units are far and away a major improvement over our first three types. Tactical designs cover a huge range of types due to the widely varied nature of tactical applications, but some common traits shine through. As the name implies, these flashlights are designed with tactical applications like law enforcement and military use in mind, and as a result are constructed of high grade composites or aircraft grade aluminum. They are usually waterproof and designed with high grade internal components to resist damage from impacts and shocks. Switches are push button designs intended to allow one handed operation of the light in tandem with a firearm, and lenses are high grade impact and scratch resistant glass or Lexan. 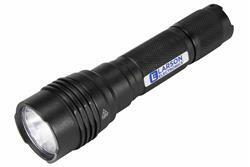 Many tactical flashlights, like those from Larson Electronics, offer different operating modes such as low, high, and flashing modes. Bulbs for tactical flashlights are typically of a higher caliber than common flashlights, with Xenon, Halogen, HID, and LED bulbs being the lamps of choice. Power for these tactical flashlights is usually provided via 2 alkaline D-cells, 2 rechargeable D-cells, or rechargeable NiMH or Lithium Ion battery packs, with the last being the most effective and long lived. Output for different tactical flashlights varies widely due to a host of factors including bulb type, battery type and bulb wattage. Some common lumen output level ranges for tactical flashlights are as follows according to lamp types. It's important to note that there is some correlation between lamp type, lumen output, and operational battery life. Halogen and Xenon bulbs are basic incandescent lamps, and as a result have poor efficiency and short life. Xenon bulbs are the least efficient and as a result cause a fast decrease in battery power. Halogen bulbs offer some increased efficiency as well as lumen output, but the increase in efficiency is offset by the higher output, resulting in an operational battery life similar to that of the Xenon. Hid bulbs offer the maximum amount of lumen output, period. Depending upon the type of flashlight and battery configuration, HID flashlights can put out well over a thousand lumens. HID bulbs have no filament and are highly efficient; however, they require a ballast and as a result take several seconds to reach their full power. Additionally, the extreme output of HID lamps, although highly efficient, causes them to drain batteries at a rapid rate. Most HID flashlights will operate for 1-2 hours before requiring a recharge. LED lamps offer the greatest balance between lumen output and battery life. LED tactical flashlights often produce between 100 and 300 lumens and will run 5 to 20 hours before needing recharging. LEDs represent an extreme and highly variable end of the lamp spectrum, with ultra high end LED units producing up to 1000 lumens. LED output has a significant effect on battery life. Lower output tactical LED flashlights in the 90-180 lumen range will often run for up to 50 hours on a single battery charge. 500-1000 lumen versions usually last for approximately 2-5 hours before requiring recharging. For overall performance, LED equipped tactical lights are hands down the best choice, with lamps that will last for the life of the flashlight, long battery runtimes, and very good lumen output with little lumen drop off until the low end of battery life. While this is by no means a comprehensive or even detailed explanation of all the flashlight types out there, it should provide a decent working knowledge of what to look for the next time you are in the market for a good flashlight that won’t fall apart or fails to turn on when you need it the most .